Pre download the "TeamLab" app prior to getting to the gallery. The internet service isn't great there and the app is the information for the self guided tour. You will want to have it with you to learn about each of the installations, its pretty interesting! In order to "Create the Star" in the Crystal Galaxy, you must visit www.universe.team-lab.com, pick a star formation and swipe up to send it off into the universe. This controls the light formations while inside the installation. There are no formal guides at Team Lab, but you can ask questions to any of the team members around the installations. Go on a Thursday after 4pm. (They close at 7pm) Its the least crowded of any of the days and this way you might be able to get some great shots inside the Crystal Universe without anyone photo bombing you! Visit the "kids area". Sounds lame but I highly suggest checking out "Sketch Town". Your artwork is first drawn, then scanned, and finally made 3D and projected alongside other people's art to complete a virtual townscape. Installations are interactive but DON'T touch anything. GIve yourself a good hour to fully see all the installations. General admission is $20 and $15 if you're a student or senior. You can pre reserve tickets here. Be prepared to be transported to a far off galaxy in Japanese tech art studio, Team Lab's, newest fully immersive installation, Crystal Universe. 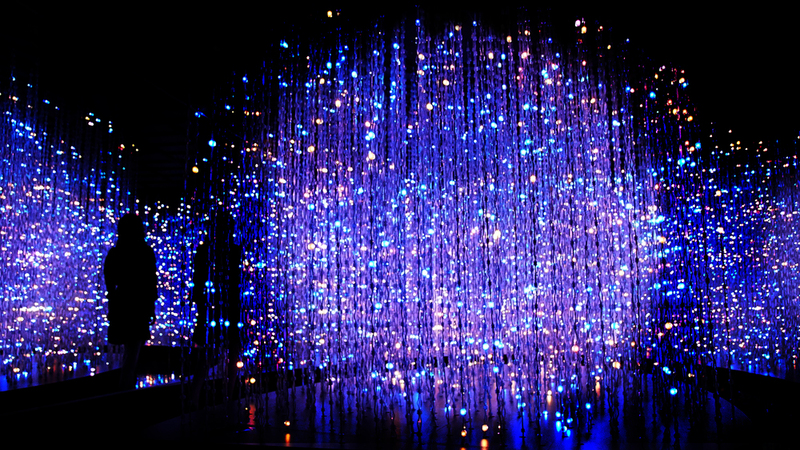 This Tokyo based collective has installed 60,000 suspended LED's in a vast array of colors and specific spacings, creating a spectacular appearance of infinite stars, cascading in every direction. You become mesmerized and transported to another time and place. Viewers enter the space and can immediately affect and change the way the lights change throughout the entire installation. Viewers have the power to alter the Crystal Universe with the swipe of your finger from your smartphone and can set stars off into the sky. Different stars have different affects in the space and you control it all. You become the center of the universe and its absolutely magnificent. Despite the main attraction being the Crystal Universe, Team Lab has plenty of other installations that are note worthy. At the immediate start, you will see Light Sculpture of Flames, an interactive piece made of, you guessed it, lights. A virtual flame burns in the center of the installation using accumulated light particles to for a sculptural object. The flame appears as a solid object with a flickering movement in various layered colors. Each flicker and movement is not pre recorded and is unique and never repeated making each sight entirely unique to the viewer. Seeing Black Waves, truly removes the boundaries between humans and nature. Its moving. You feel apart of the crashing of the waves, the movement, the emotion, the deep dark waters. Viewers of this installation will recognize this famous Japanese painting but with a very unique twist. You stand spellbound to its unique beauty and watch the waves unapologetically crashing down, meanwhile knowing its only a replication of a natural phenomena. Click here to see the magic of the dark waves. At first glance, these digital flower walls seem unassuming and understated. As you most closer to them and look closely, you will notice the flowers turn from bud to bloom to full florals and then slowly wither and then eventually fade away; the cycle of a flowers life. Depending on the distance of the viewer to the installation, will determine how quickly the flowers lose their petals, whether they just wither away or if they bloom and come back to life. The interaction between the viewer and the installation can never be replicated and offers continual change in the artwork. Similar to Flowers and People, Flower and Corpse Glitch Set of 12 consists of 12 film stories based on the themes of civilization, nature, collision, circulation and symbiosis. 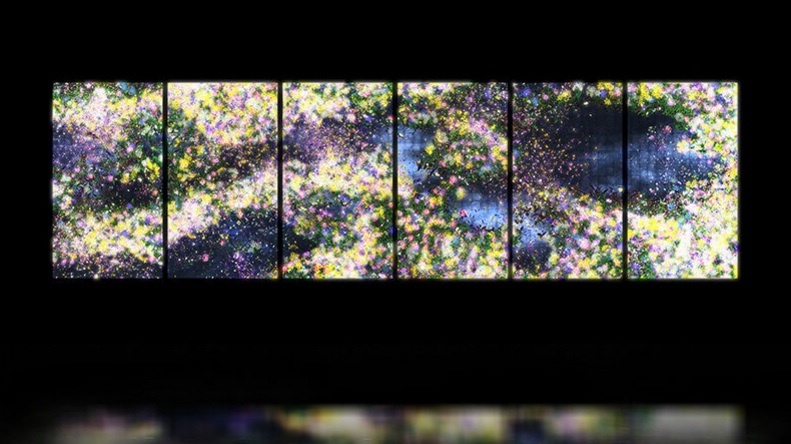 On the surface, it may simply look like a set of 12 Japanese paintings, but based upon the concept of "Ultra Subjective Space", the work begins to peel away the surface painting and teamLab then reveals the 3D production process to the viewer. Click here to see the action. So Bay Area friends, get up and go tantalize your mind and eyes and step into a galaxy far far away. 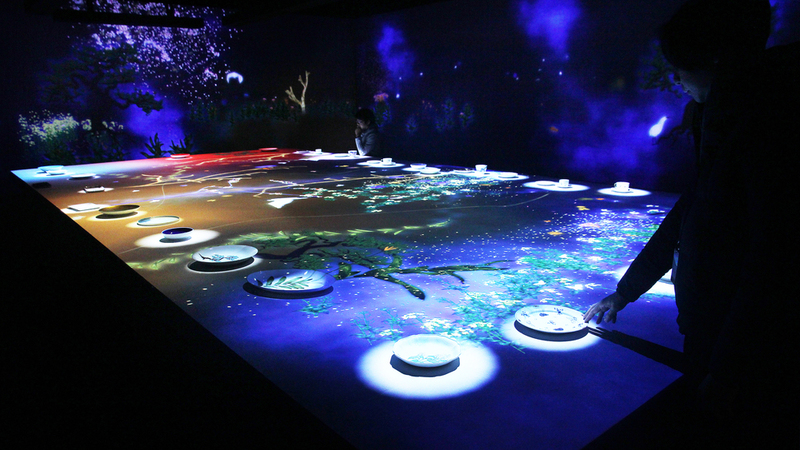 Spend an hour getting lost in the beauty of Team Lab's: Living Digital Space and Future Parks. I promise you will find something that enthralls you! In the comments below let me know what you think of the exhibition. 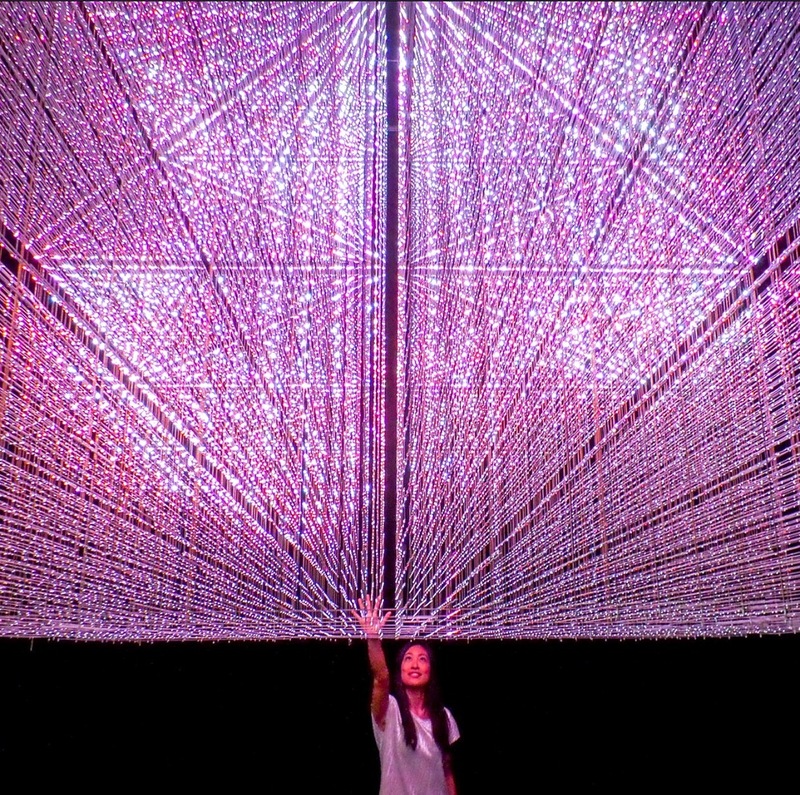 Here are some other incredible installations by Team Lab that are currently in exhibition around the world. Mind BLOWN.